When life’s too short to be doing laundry, you want washing and drying clothes to be as efficient as possible. Since the laundry can take up valuable time and space in your home, a functional laundry will help free up time for you to do better things. Whether you live alone in a studio apartment and do laundry twice a week, or family demands make it a time-intensive daily activity, laundry is easier when everything is in order. No matter what size house or household, Fisher & Paykel has front- and top-loader washers and dryers to help lighten the load, no matter what size house or household. When space is limited in a studio apartment, and a laundry is simply a single appliance in a cupboard, a washer dryer combo is a two-in-one solution that will save space as well as time. Compact all-in-one front loaders are easy to install under a bathroom or kitchen bench-top or into a hallway cupboard and will wash and dry an average load in less than three hours. Specific wash cycles range from delicate to heavy, so you can wash gym gear, delicate’s and towels without worry. And as no venting is required for installation, it means less humidity in a small studio space. Space is equally valuable in apartments where washers and dryers are likewise hidden behind cabinetry. Side-by-side front-loading machines allow for usable benchtops above, or stacked machines make for efficient use of cupboard space. Townhouses may have a small laundry room, but when space is still at a premium, stacking front-loading appliances will free up valuable floor or storage space. Perfect pairs of designed-to-match washers and dryers look good and perform well with complementary designs, dimensions and easy-to-use interfaces. And because you love your clothes, Fisher & Paykel FabricSmart™ washing machines care for your precious garments. Your favourite pieces will look and feel like new with specialist cycles for woollens, delicate’s and gym gear. In a rush? Most wash cycles take less than an hour to complete with Fisher & Paykel Vortex Wash, and the Time Saver option activates a special temperature profile and unique tumble sequence to speed things up even more when time is of the essence. Larger laundries are a must-have when your kids’ come home in dirty school clothes and muddy sports gear. And while larger laundries offer more room to move, good design and functionality is no less important for efficient time and space. 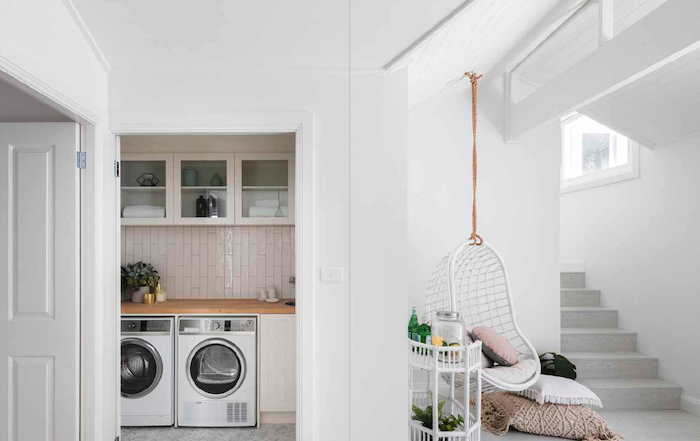 Fisher & Paykel’s top-loading washing machine is the perfect choice for meeting the demands of families who do lots of washing, which is why it was voted as Australia’s most popular top-loader by Canstar Blue. The SmartDrive™ technology and flexible fins in the agitator work together to optimise the wash and offer superior fabric care. Based on the resistance of the load, the fins determine the fabrics, sense the soil levels and provide continuous feedback to the motor, creating thousands of specific ‘wash profiles’ in comparison to other brands that only have up to six wash profiles. Fisher & Paykel’s top-loading washer ranges in capacity from 5.5 to 10 kilograms to handle family-sized loads and bulky items, such as doonas. And because the machine might be going all day, SmartDrive™ allows for a reliable, quiet and efficient wash while maintaining performance in back-to-back cycles. So now you have the laundry sorted, you’ll always have fresh, clean clothes at the ready for doing better things.